We know that students are more likely to be interested in what they are learning, and more motivated to learn if what they are learning reflects their real-life circumstances and addresses topics that are relevant and applicable to their lives outside of school. Learning Expeditions, which typically take place over several months, bring real-world learning to life; students are presented with a real-world problem, undertake a series of investigations or case studies related to that problem, engage in fieldwork during which they conduct research and learn from experts, and create a product, or series of products, that they present to an authentic audience. 7th Graders at Launch marching against gun violence in their neighborhood. In science class, students look at gun violence from a public health perspective, comparing American gun and violence statistics to other countries’ statistics. In literature class, they read Kekla Magoon’s How It Went Down, a story about the fictional shooting of a young black boy, and discuss what about the story resonates with them or feels familiar. In Social Studies, students learn about the Bill of Rights, exploring the 2nd Amendment deeply. And in Writing, students explore how writing can be used as a vehicle for social change, and create their own science fiction stories as an antidote to gun violence. Reflecting on what they are learning these classes, students share their views on guns control in America on an interactive blog. 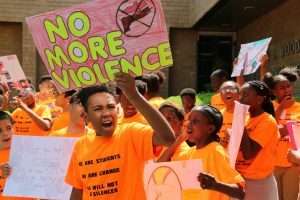 The expedition culminates in an annual Walkout to End Gun Violence, during which students march from their school to a local public plaza carrying protest signs they created in their digital media class. At the plaza, students lead an anti-gun-violence demonstration, presenting speeches and sharing original poetry and songs with the gathered community. Channel View senior Giselle reflects on her journey from a nervous freshman to a student leader.